*Lunch and Dinner options available for matinee and evening show. The Greg Frewin Theatre presents NIGHT FEVER! Two great tribute bands, one night, all on one stage! Relive all the hits from two of the most iconic 70’s pop bands ever to hit the stage! The Bee Gees have been outwitting the international music scene with their incredible tenacity to remain current through all time spans of contemporary music. The vocal match of this tribute band creates an eerie sense of seeing the Gibb brothers in concert. 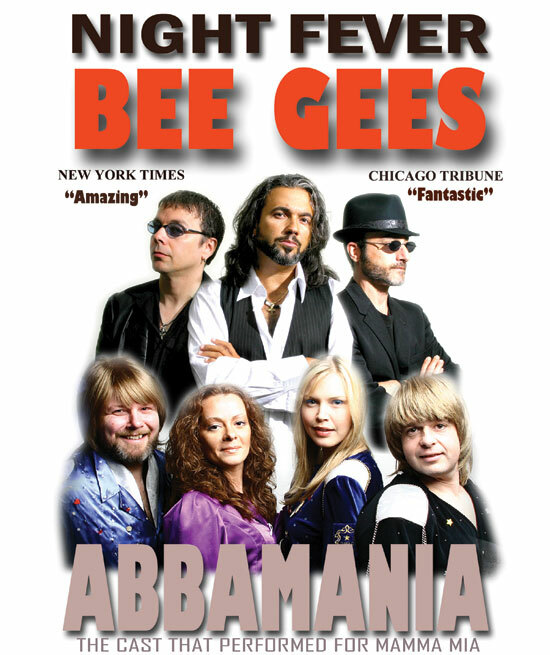 ABBAMANIA is a Canadian produced rock musical, which takes you back to the disco era of one of the best pop bands in history, features nine incredible musicians and singers. The four performers not only look exactly like the original band members they also sound unbelievably like them.